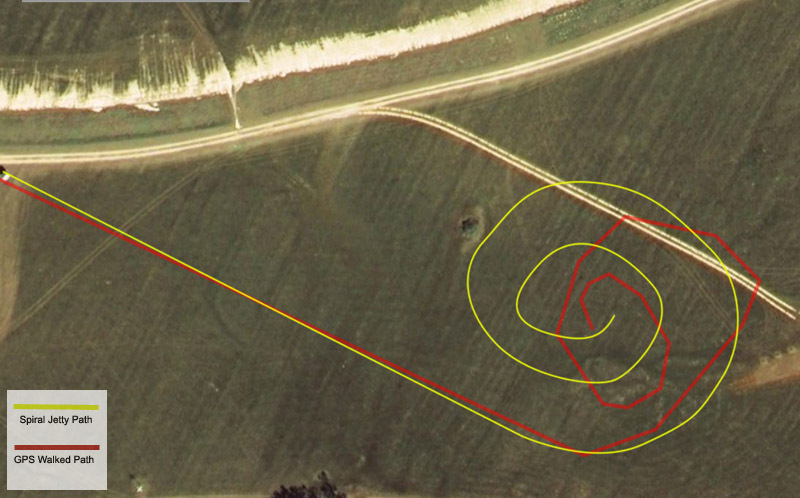 I came up with the idea for this project when I decided to look at Robert Smithson�s earthwork, Spiral Jetty, using Google maps. What I quickly realized was that, due to the ambiguity of the surrounding landscape, I had no real idea what the scale of the piece actually was. There were no houses or buildings to give me an idea of the size. There were a few roads but they seemed to be unpaved and hard to categorize, scale wise. I read that the Spiral Jetty was 1500 feet long and decided that I could use that measurement to create an analogue, which I could compare to surroundings that were more familiar to me. 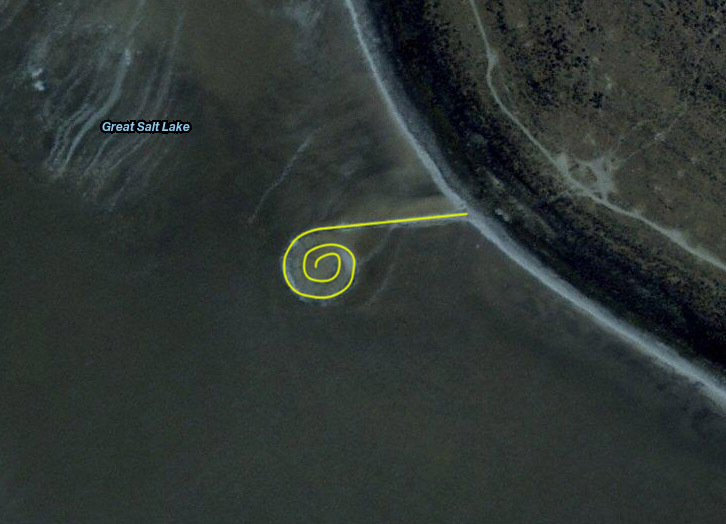 To create the analogue I used Photoshop to trace a pathway along the Spiral Jetty. I could then use this exact pattern to place over the top of areas selected in Google maps, in order to pinpoint locations that would allow me to walk the path of the earth work. I looked for areas that the jetty would fit in and found it hard to find spaces which were large enough for the pattern. 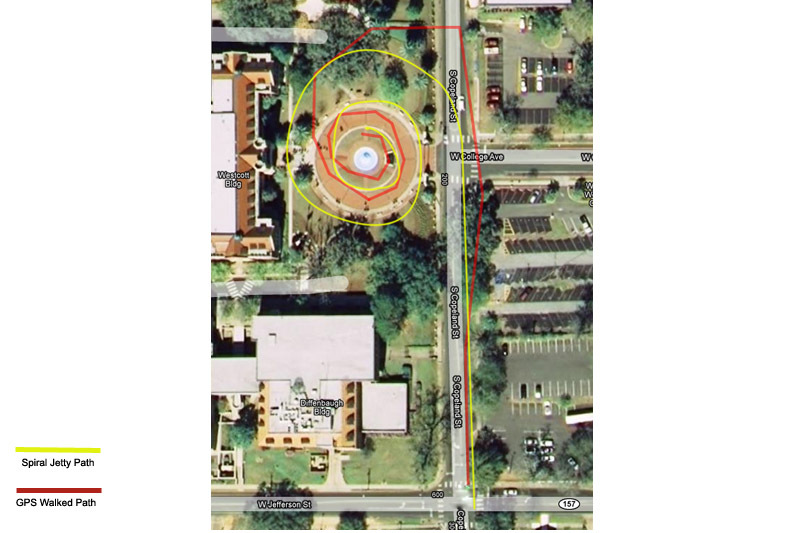 I finally settled on three initial spots: Landis Green, which is near Strozier Library on the Florida State campus, the fountain in front of Wescott, and an open field in the J.R. Alford Greenway, which is on the east side of Tallahassee, Florida. Walking the path of the Spiral Jetty was just as important as the structure itself, Smithson stated, so, I decided I would walk a path as similar to Smithson�s as I possibly could, without the aid of marking stakes or direct measurements. 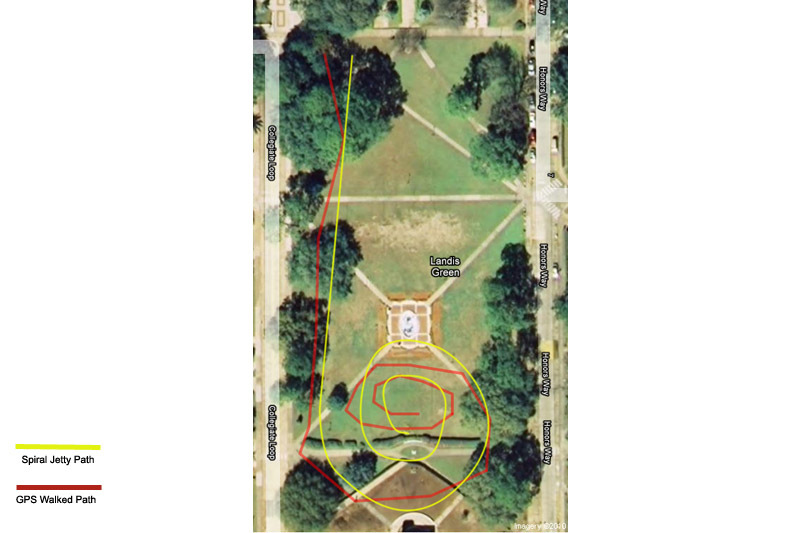 My only tool would be an Iphone and an app that utilizes GPS data in order to �draw� a path. I wanted to be able to differentiate between the paths. The walked paths ended up differing from the original path quite a bit, but I liked the contrast when shown on a composite map of the two. I found that the more people were present when I was walking the path, the further from the original the end result was. Landis Green had quite a few live action role players and sunbathers directing my path from its intended geometry. Wescott produced a gaggle of overachievers in suits being photographed, which led to my decision not to climb over a small fence. The greenway was the most successful and was also the most devoid of other people. My choice to name this project, sites of non-site sites, stems from the definition that Smithson gave for his scheme regarding work in nature and work shown in a gallery. This project is outside but the path is derived from a map. Under Smithson�s definition outside equates to �site� and a map would refer to �non-site�. So, this project has a map which refers to a place, which references another place, and also exists in specific locations but is not visible to the eye. Therefore, the site is a non-site site because it manages to be both things at once, as well as being an analogue of the original. It is interesting to me to play with Smithson�s ideas of mirroring. He states that, �It�s like the art in a sense is the mirror and what is going on out there is a reflection�. In my project, the art is a mirror of a mirror of a reflection, as well as an appropriation. The final aspect of note in this project centers around the idea of entropy. The Spiral Jetty has, at times, been submerged under water and its coloration has changed very much over the years. Some people have stated that they would like the work restored, but others believe that Smithson liked the idea of entropy and that he would want nature to take its course. By uploading my analogues using Google maps, I am, in a sense, digitizing my paths, which are a direct reference to the original artwork. This digitization serves to, at the same time, preserve the earthwork and disrupt its natural demise.